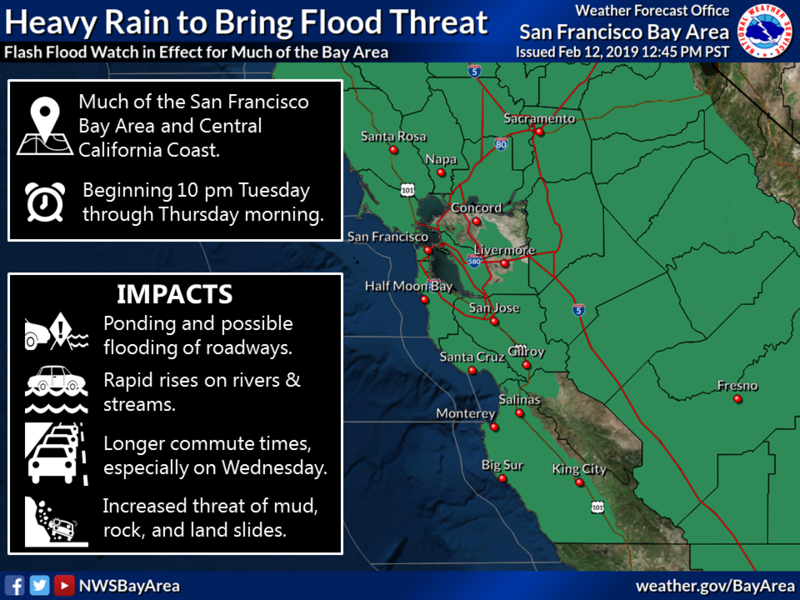 The National Weather Service has issued a Flash Flood Watch and High Wind Warning for much of the Bay Area Tuesday night through Thursday morning. Heavy rain and high winds, gusting 45 to 60 mph in some areas, combined with already saturated soil will significantly increase the potential for power outages, flooding, mud slides and other storm related damages. The storm is likely to adversely impact local travel and commutes. RAINFALL: An atmospheric river with origins near Hawaii is forecast to reach the San Francisco Bay Area and Central Coast late Tuesday night and continue through Thursday morning. Rainfall rates of half an inch per hour are possible during the heaviest showers, with the highest rates in the higher terrain. Recent rainfall has saturated soils across the area, and the additional heavy rainfall will create the potential for widespread shallow landslides, rock-slides, and debris flows. Periods of heavy rainfall will likely inundate storm drains with rapid rises on small creeks and streams. 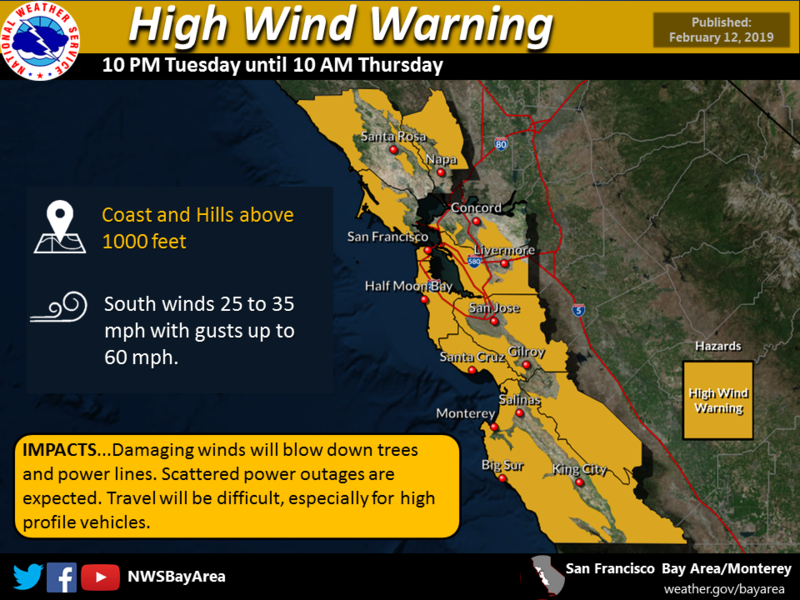 WINDS: Elevations above 1000 feet will experience the highest winds, with sustained wind speeds of 25 to 35 mph and peak gusts of 45 to 60 mph. . TIMING: 10 pm Tuesday evening through 10 am Thursday morning. The strongest winds are anticipated through Wednesday morning and early afternoon. POTENTIAL IMPACTS: Expect rapid rises on flood-prone creeks, streams, and rivers. Power outages are possible due to damaging winds which may blow down trees and power lines. Travel will be difficult, especially for high profile vehicles. The Wednesday morning commute will be adversely impacted with potential flooding of roadways. Periods of heavy rain are also possible during the Wednesday afternoon and Thursday morning commutes. Tune to local media outlets for storm updates and exercise caution when traveling.